I woke up in Boston. I fell asleep over the ocean. It’s crazy the difference a day can make. It was very hard to pay attention to anything academic; our flight wasn’t until 10:45pm so I was in school all day. When I got home the butterflies began to kick in. How crazy was it that we were bringing all ten of us onto a plane and flying across the ocean? I ran frantically around my house making sure I had packed everything, while repeatedly saying to my siblings, “Can you believe we are doing this? Can you believe all our cousins are going to be there? Can you believe Joey is going to be a priest?” We had frozen pizza for dinner, while trying to calm the kids down before we left for the airport. They were extremely hyper and full of energy. At around 6:15 we left for the airport, with lots of excitement. We arrived with plenty of time, and pretty much flew through customs. Once we got to our gate we just watched the Celtics game. Because we had a baby, my sister Annie, we got to board first. Then the journey really began. After a long flight, we finally landed at Leonardo da Vinci- Fiumicino Airport at 12:15 Rome time. Just by looking out the window at the Airport, Rome is much greener than I expected. Once we made it out of the terminal, we met my Aunt Helen ‘07, who lives in Rome, and my Aunt Tricia who arrived a little earlier than us. As a group of about 20 people, we headed out to the three vans that would bring us to our apartment. Once we arrived at the apartment, we were greeted by my aunts, uncles and cousins who were already there. We settled in at the magnificent apartment, and took in the amazing view from the terrace. For the rest of the day, we hung out with our family members and ate good food. The whole time it felt like we were living in a dream. Not only were we in a magical setting, but we were all catching up after not seeing eachother for so long. At 8am, my immediate family, Uncle Tom and his girlfriend Maggie were picked up by our tour guides who were going to show us around the city. Our first stop was the Colosseum. It was a little rainy, but that did not take away from the magnificence of it. As we approached it from the side, the massive walls surrounded us. It looked much smaller from the outside. The ruins in the middle looked like locker rooms or lane lines! Next, we headed to the Trevi Fountain. Lots of people were throwing in coins. It looked just like in the movies, but smaller than I expected it to be. After we took the appropriate amount of touristy photos, we had to muddle our way through the anxious crowd of tourists. After the Trevi Fountain, we went to the Spanish Steps. The view from the top was beautiful, but there were lots of gypsies so we had to be careful. The next stop was the Vatican. When we went to the Vatican, we had a full 2.5 hour tour of the whole country! Some of the highlights were the Sistine chapel and St. Peters. Both were absolutely stunning, and it felt like I was walking through the Medieval Renaissance curriculum from Eighth Grade! The rest of the day was spent hanging out with the family back at our dreamy residence. This is the day we all came for! It also was my 16th birthday, so my dad took me out to get a cup of coffee and muffin at a cute little cafe down the street. I enjoyed sitting in the cafe, watching the hustle and bustle of the locals beside me. For these regular citizens, it was just a regular Saturday morning. But for me, I was celebrating my 16th birthday in Rome! After a nice (but strong) cup of coffee, my dad and I had to go to three different bakeries to get enough pastries for everyone’s breakfast back at the Villa. If we didn’t, we would buy out the whole bakery! When we returned, we had a sweet brunch with the whole family. There was lots of singing, dancing, and many attempts at a full group picture. My Uncle Tom also revealed a tee shirt that he designed to help commemorate the trip. After brunch, my dad, Uncle Tom and I took all of the kids to the park next door so that the moms could prepare to get everyone ready for the ordination. When we returned, we all got ready for the ceremony. When we arrived at the church, Saint Eugenios, there was already a huge crowd forming, despite the fact that we were early. When the doors of the church finally opened, we used the strollers to our advantage to secure seats for everyone in the front. The ceremony overall was really moving and spectacular. It was also amazing that all of the kids survived the entire ceremony! Then we headed to a garden for a reception with all of the new priests and families. It was crazy to think that we now had a priest in the family! In the morning, we took a bus to the house where Joey lives to have a meeting with the Prelate of Opus Dei, Fernando Ocariz. All of the families of the newly ordained priests were invited to this get-together. He spoke in Spanish, so we all had translators so that we could understand what he was saying. There were three people who had the opportunity to talk to the Father with a microphone, asking a question and telling a little bit about their family. My grandma, Mrs. Keefe, had the opportunity to speak to the Father. She told him all about our Family, and how everyone had travelled to Italy to be there for the ordination. He also told him about the singers. So, my uncles got to sing for the Prelate! Of course, he loved it. Someone took a video and posted it on the Opus Dei Facebook page, and it has over 12K views! After the meet and greet, we went to St. Peter’s square. For the rest of the day we were at a reception at the restaurant with all of the family and friends who came for the Ordination. For me, this was the best and most profound day. Fr. Joey was able to say his first mass over St. Josemaria’s grave, in the Prelatic Church of Opus Dei. Here also lies the remains of Blessed Alvaro, Bishop Echevarria and other important people of Opus Dei. The mass was beautiful, and really blew my mind. I felt like I could feel the Holy Spirit in the whole room, more than I ever had before. Seeing Fr. Joey perform the Consecration for the first time was really moving. After the we dried our eyes after the emotional first mass, we went for another reception at a delicious restaurant with family and friends. The kids put on some performances, just like they had every night on the terrace for all of us at the apartments, for everyone else to enjoy in addition to the singing. After the reception, we went to my Aunt Helen Keefe’s ‘07 house. She lives at an Opus Dei center in Rome. This was the second best part of the trip! Some of the girls at the house took all of the kids into a room full of candy and Disney music, aka Kid Heaven. All of the adults went into another room to talk and hang out with all of the ladies. There was more singing, eating, and of course, laughing. All of the ladies were so nice and fun to be around. I was able to hang out with Ms. Higgins, who lives with Helen in Rome. There was so much happiness in the house, that it makes me smile just thinking about it. My little cousin June had the privilege of having her First Communion in Rome with Fr. Joey! We had a family mass in a chapel at St. Eugenios. The music was prepared by June and her sister Martha, and my uncle John, their dad. Afterwards we went back to the house for lunch. In the afternoon, we walked up to the Piazza del Popolo, at the end of the street and got some gelato. Again, there was more singing in the Piazza and outside of the gelato place. All of the Italians loved it, they were dancing and taking videos with their phones. Most notably, a guy with a selfie stick was taking a video right up close and personal. We had fun just enjoying the music and the local passerbys in the Piazza. Unfortunately, this was the day we left. But in the morning, my Aunt Helen took my sisters Josephine and Theresa, Uncle Paul, my Uncle Tom’s girlfriend Maggie, and I to the Papal Audience in St. Peter’s Square. I could not really understand when he was talking, but I understood when they did the French translation! It was cool to be able to see Pope Francis in real life, and to hear is voice in real life as well. There were lots of people there and everyone was happy listening to him. I also enjoyed the chants, especially the Spanish ones, that people did when he was going around in his Pope-mobile. On the way back, my aunt took us to her favorite gelato place. It was amazing! They put nutella at the bottom of the cone, and the texture of the gelato was nice and creamy. I got one scoop of biscotti and one scoop coffee. The biscotti flavor is basically cookies and cream, Italian style. I learned that when you go to a gelato place, you don’t just get one flavor, but two. When we got back to the apartment, we got right into the vans to take us to the airport. 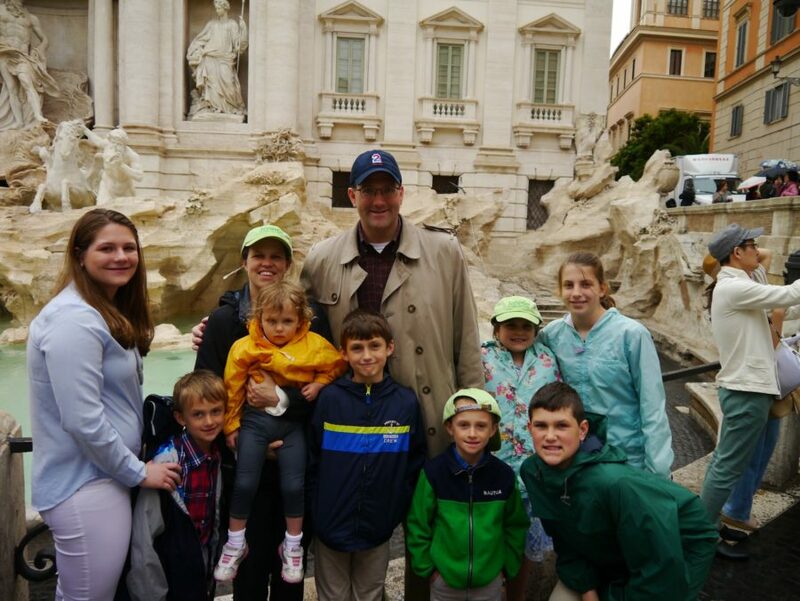 My family and I got a little taste of heaven during that week in Rome. I still find myself saying, “Did we really do that?” The best part about the whole experience was that we were all together. We could have been in the middle of nowhere and still have had the best time. But we were in paradise, all together. There was lots of calories consumed, miles walked, and places seen on this trip. But most of all, there was lots of love. And that is what made this trip so special.